Continue reading the full article and results below! It doesn’t feel like it, but we started training on November 6th. That’s more than three and a half months ago! 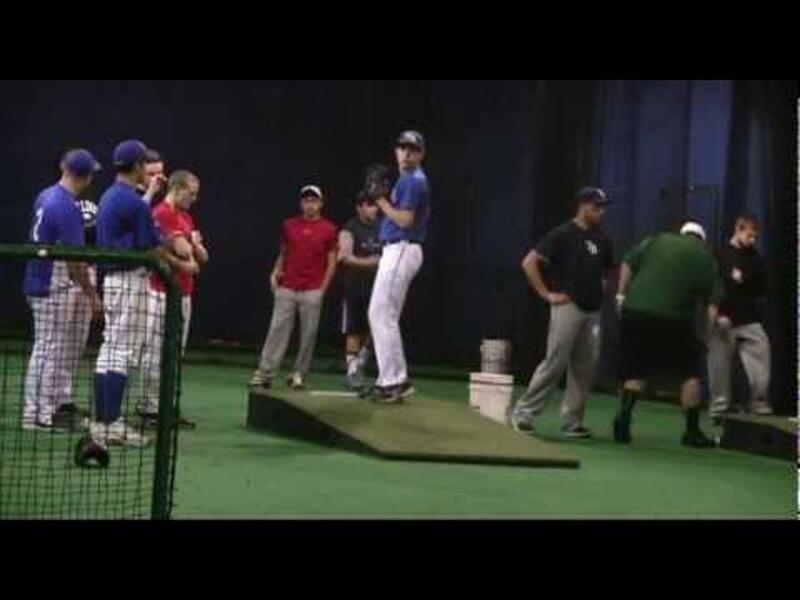 In that time, we (instructors) have watched a lot of these kids transform their throwing motions into movements that have allowed them to increase arm strength, conditioning, and health. This was accomplished through the implementation of a program that was focused around overweight (above 5oz) plyo ball drills, long toss, and most importantly, post-throwing arm care. Plyo balls are basically smaller versions of medicine balls. The high school players used weights of 4lbs, 2lbs, 1lb, 11oz, 9oz, and 7oz. Our 13-14 year old group used all but the 4lb ball. It is important to note that this was NOT a velocity-focused program. If given another 4-6 weeks, this would have been the next logical step. In the time that we had (approximately 12.5 weeks) we had to make sure everybody took the necessary amount of time (approximately 3 weeks) to get their arms back into the swing of things, as most of the players had taken a significant time away from throwing. This was probably the most difficult part of it all as several kids were already built up and ready to roll. Once we determined that everybody was ready, we gradually introduced the weighted plyo balls into their pre-long toss routine. Increased workloads and more intense drills were added as they progressed through the program. I won’t get into detail on the drills, as that will be the focus of an article to come. The details of the long toss portion are already available from an earlier posted article, as well as a “tip of the iceberg” article on arm care and recovery. Almost ready for the results. Just a couple more things. First, we tested three times throughout the program…December 7, January 18, and February 15. For each test, the player was allowed to move his feet however he wanted to try and create his best velocity. They were allowed 3-4 throws and their top throw was recorded. The main issue with the data is that not all of the 69 players participated in the 2nd and/or 3rd tests. The main reasons were illness related or due to basketball schedules. I’ve done my best to filter the data accordingly. Considering all but 2 players had velocity increases, these numbers will paint a very clear picture even with the missing tests. Lastly, I have everything broken down to their practice groups. Once again, you’ll see a common theme with the numbers so I didn’t waste additional time by analyzing them over a bunch of different criteria. This group contains all HS athletes from freshmen through seniors. There is a wide gap in overall physical development over that span, so the spread of actual velocity numbers is also wide. We are more focused on the improvement from start to finish (those numbers are in parentheses). This group had the majority of the missing numbers due to basketball, etc. There was still plenty to work with, however. I am certainly excited about these improvements in velocity, but what I am most pleased with is how strong and healthy the players claimed their arms to be. It was made very clear to the players that they were to report to me any issues (soreness, pain, discomfort, etc.) with their arms. My plan was to be overprotective of them throughout this process. In fact, we built in a de-load week whereby the intensity and number of throws were reduced. This was actually not received with open arms (pun) as everybody wanted to continue getting after the work. There were indeed some arm complaints, which is to be expected. Each case was either from a previous issue or a clear structural issue such as poor mobility. For the former, we addressed the issue as best we could; in some cases shutting the player down from throwing for a period of time. The latter was quite a bit easier as we simply lightened the intensity and let the program do the rest of the work. These results were excellent. The key now will be for the players to not forget what got them to this point. It doesn’t take long to get out of a routine, as we all understand in some regard. I’ve already had a report back from one high school coach that his players (those who were in the program) instinctively grabbed the plyo balls as soon as they were turned loose to get there throwing in. Hopefully, the other teams are doing the same!